Having said that, there are people out there who will be more into winning than being smooth, but is that a bad thing? Some may say yes, others no. There certainly is a time and place for winning, but during developmental rolls, against new people or whilst drilling? Surely not. I don’t think it boils down to the fact of winning and losing though as it’s no coincidence that if you do everything as smooth and as technical as you can that then you’ll hugely increase your chances of winning. It’s definitely a point to ponder isn’t it? Is grabbing a few short term taps better than working technically and making your game as smooth as possible for the long term? 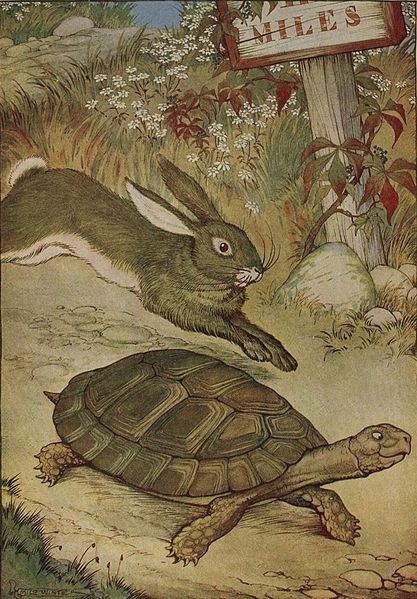 The tortoise and the hare come to mind instantly, so have a think where you stand and how it might effect your training and those you’re rolling/drilling with, as it does. Nice post! I am not completely interested in winning rather I’m more interested in improving my techniques, body movement, and body control. One thing I am working on is my aggression and how that plays into the game of BJJ. I would like to add you to my blogroll. I also prefer to focus on other things than just winning, I think in the long run it just makes you a better grappler and a better coach. Some might say that you need sweeps, control, body mechanics etc to win, but I think that some people can fall into using a limited set of moves against everyone just to get taps, rather than working on their weak areas or the smoothness and productivity of their game. I think Dean Lister said it best – ‘The more you tap, the more you learn’. I mean what is the person using the same transistion to submission for the 764 millionth time learning? Probably not a lot now, but the tapper is the one who learns the most at that stage. Things become different once you’ve been training for like 12 years but for most having such a perspective can be restrictive to your development and the development of others, especially if you’ve not mastered the basics.